On the surface, Sunrise is perhaps best remembered for its groundbreaking technical achievement in the field of sound. Produced in 1927 by Twentieth Century Fox, while Sunrise is categorized as “silent” for its lack of audible dialogue, it stands as one of the first features made by a Hollywood studio to boast an authentic soundtrack complete with special sound effects in addition to the score that accompanies the film. Yet more than just memorable as a footnote in film audio history, Sunrise is breathtaking from a visual standpoint as well and the impact of its beautiful frames easily overshadows anything that's on the film's soundtrack. Directed by German expressionist master F.W. Murnau as his American stylistic crossover picture care of producer William Fox, Sunrise: A Song of Two Humans finds Murnau at the height of his filmmaking powers in taking all of the expressionistic tricks he’d used previously but relishing in the chance to take them that much further thanks to having the full force of Twentieth Century Fox at his disposal. Like a kid in a candy store, Murnau lets loose and takes all of Fox’s toys out for a spin and the amount of creativity on display in the realm of editing and cinematography still have the power to give viewers goosebumps to this day. From its no-holds-barred use of forced perspective, staggering tracking shots and fearless decision to split the frame in half and expose two completely different sequences at the exact same time, Murnau changed the game of motion picture direction with a film that is a true collaborative work of art and one that reminds budding filmmakers that your movie will only be as strong as your weakest department. While admittedly – and despite fine turns by silent era favorites George O’Brien and Janet Gaynor – the picture’s An American Tragedy like tale of a dark haired temptress from the city who tries to seduce an otherwise happily married farmer to kill his loving wife (Gaynor), sell his farm and run away with her before ultimately realizing the error of his ways is a bit simplistic in the long run. Nonetheless Murnau elevates the plot with a visceral, highly emotional expressive approach. And in doing so, he reminds you that Sunrise at its heart deals with the timeless nature of happiness and how easily it can be to take for granted all of the things you have when faced with something you don’t, which as the opening titles note can occur anywhere and everywhere to anyone at all. 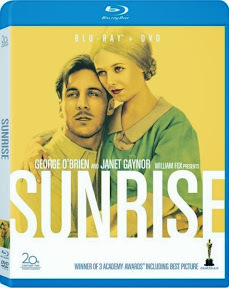 Not content to let it become a soapy melodrama or a preachy weepie with a hard-hitting approach that hits its emotional highs and lows with as much force as the musicians use to play the film’s gorgeous score, Sunrise manages to fool even those who – like this movie buff – have seen so many films that they figured they could see every plot twist coming a mile away. Using his technical virtuosity to drive you to distraction, Murnau crafts a work that envelopes you completely. First dazzling the senses – before you know it Sunrise sneaks up and grabs you for a surprising nail-biter of a final act that pays off on the cyclical nature of the title by harking back to a plotline introduced early on that audiences thought had been abandoned once the couple journeys from the country into the big city for a wild adventure together. Containing both the original Fox Movietone Version as well as the roughly twenty-minute shorter European silent cut of Sunrise, Fox’s gorgeously remastered new Blu-ray combo pack release also boasts a bonus DVD of the acclaimed title. In an edition that nearly rivals a Criterion release, Fox serves up notes on the movie’s historical restoration as well as the original script and scenario by Carl Mayer complete with annotations from Murnau. A nicely timed high definition debut of one of Fox’s first Academy Award winners to tie right into award season, Sunrise also offers an educational commentary track by ASC Cinematographer John Bailey that’s sure to go a long way in greater dissecting how Murnau and his photography team comprised of Charles Rosher and Karl Struss achieved some of the film’s most iconic shots and awe-inspiring cinematic sequences. A must for any serious film fan, while Sunrise made a major splash as an early harbinger of what was to come in the field of motion picture sound, Murnau’s American introduction to German Expression has since gone on to be recognized as one of the greatest films ever made. And with so many silent films lost over the years, thanks to this release, Sunrise will continue to shine brightly, inspiring new generations of film lovers more than eighty years after Murnau first called "Action" on the Fox lot.